Israeli defense contractor Elbit Systems’ UK factory will become the target of a protest to mark the anniversary of the Gaza conflict in July. Anti-arms trade campaigners will join forces with students unions and pro-Palestinian groups in a bid to shut down the factory, which they say manufactures drones. 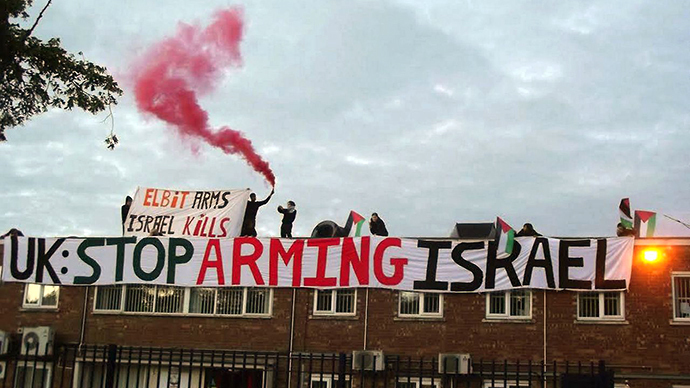 Activists occupied the same factory in Shenstone, near Birmingham, last year, causing it to close down for two days and reportedly cost Elbit over £100,000 in damages. Campaigners are calling for the UK to stop selling arms to Israel, highlighting the state’s role in last year’s Gaza conflict, which caused the death of over 2,200 Palestinians. Elbit Systems’ British subsidiary UAV Engines manufactures engines for the Hermes, one of Israel’s primary armed drones according to a Human Rights Watch report. Israel’s other main drone is called the Heron and is manufactured by Israeli Aerospace Industries. War on Want Campaigns Director Jackie Simpkins told RT the organization fully supports the upcoming action at Elbit factory. “War on Want has called for a two-way arms embargo against Israel for many years. We have documented the use of Elbit’s drones in Gaza and their terrifying effects, especially on children,” she said. “By continuing to license arms exports to and imports from Israel, the British government is giving material support to Israel’s aggression against the Palestinian people. “This action is part of continued efforts to intensify pressure for an immediate suspension of the arms trade between the UK and Israel,” Simpkins added. Andrew Smith of Campaign Against the Arms Trade (CAAT) told RT: “Elbit Systems has an abysmal human rights record and has directly contributed to, and benefited from, the oppression of Palestinians. A diverse group of organizations will join the protest on July 6, including the Boycott Israel Network, Campaign Against the Arms Trade (CAAT), London Palestine Action, War on Want and the NUS Black Students’ Campaign. Nine activists were charged with aggravated trespass after scaling the factory in last year’s demonstration, triggered by Israel’s Operation Protective Edge assault in Gaza. Once on the roof, they used a megaphone to declare publicly the IDF’s recent atrocities in Gaza to onlookers. Thirty-six hours into the occupation, police scaled the building and forced the campaigners to return to ground level, where they were subsequently arrested. Drones owned by the Israeli military may have been used in attacks that violated international law, Human Rights Watch and the Guardian report. The Hermes, which is partly produced in the UK, carries two Spike-MR (medium range) missiles, which are produced by Israeli firm Rafael Advanced Defense Systems. It can stay in the air for up to 24 hours at altitudes of up to 18,000 feet (5,486 meters) and is equipped with optical, infrared and laser sensors that enable it to identify and track targets. Human Rights Watch claim to have found evidence Spike missiles were used against two Red Cross ambulances during Israel’s conflict in Lebanon in 2006. Six medical workers and three patients were injured in the attack. The Geneva Convention forbids armed forces from targeting medical staff or hospitals. A Guardian investigation in 2009 uncovered evidence of alleged war crimes involving Israeli drones in Gaza. The newspaper gathered testimony on missile attacks that targeted civilians, despite the cameras on the drone providing clear pictures. In one example a family of six was killed when a missile hit a courtyard of their house, the Guardian report. UAV Engines has previously maintained that all its exports from the UK are within the law. “We support manufacturing in the UK – 95 percent of our products are all sourced in the UK,” a spokesman told the Lichfield Mercury after an anti-arms trade protest targeted the factory in 2012.